Recently one evening in class, a student used the example of modern day slavery to explain a concept, something which the lecturer had a hard time accepting, at least to my observations. When people talk or believe modern day slavery to be something that is nonexistent, I guess the only thing their minds can conjure up is the fact that slavery of the kind that saw the blacks and convicts shackled, bound and collared ended a long time ago. The days when people were sold off as slaves in countries like Australia, and this too in broad daylight in the open market places, that day has perhaps long come and gone. But slavery in itself, it exists in many forms even today, and I do not believe that the concept of enslaving people would ever die out as long as we humans continue to exploit our resources, human and otherwise, in our quest for power and wealth. Slavery is the concept that drives and thrives in the example of the little Nepalese girl brought to India in the name of giving her an honest wage earning job to make ends meet back at home, the girl who is then sold into prostitution in a bustling city that cares naught how or where the underage child who services you comes from. This girl who finds herself saddled with HIV or some other sexually transmitted disease with devastating consequences, or a pregnancy way before she is past her teens, or most often than not, the whole package deal. The shackles of slavery are what the baby she gives birth to is born with, a life of servitude in the oldest profession in the world, or worse. What is it other than slavery when child labor is exploited in different parts of the world, for instance in the carpet weaving industry in Turkey, where young and nimble fingers are overworked until they are cracked and bleeding, until their fingers are no longer able to work through the weaves and loops. 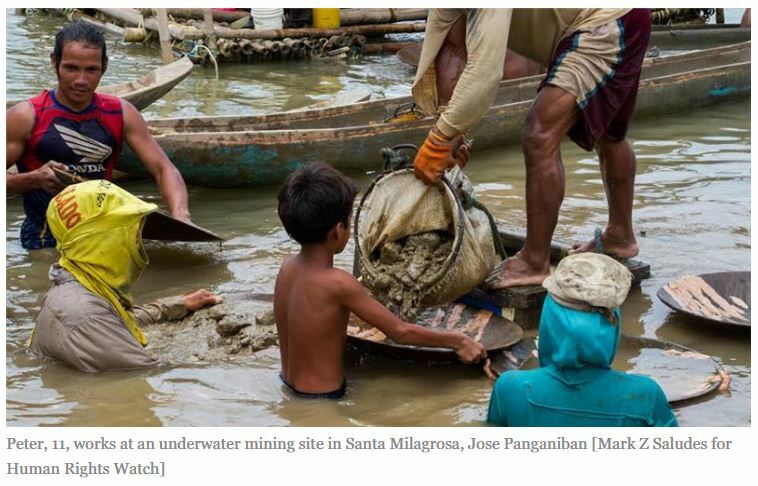 What can you call the concept of children who are forced into doing dirty, dangerous and difficult jobs such as gold mining in the Philippines where young ones are lowered into pits as deep as 25 meters on a rope, pits where oxygen is pumped in manually, shallower pits not even getting this, which as a result has seen many a death of child laborers through suffocation? What do you call this, but modern day slavery when these children are forced to leave school, leave their childhood behind and start earning their keep for survival? What do you call the Bangladeshi man for instance, who sells off his assets, mortgages his property and becomes embroiled in a vicious cycle of debt that prevents him from seeking a better life for himself or his family ever again, all because he had to pay off the agent at home who promised him lucrative work in a country like Malaysia or Maldives? He arrives in host country only to find his passport has been withheld, forcing him to work in sectors that provides little or no occupational and safety measures, working for mere pittance in jobs that the locals shun. He is exploited in every single manner possible, churning in a hopeless situation that doesn’t seem likely to improve in countries that look upon their migrant workforce with abject hostility. What do you call this vile form of exploitation where either he dies from a work related accident that could have been prevented, or he returns home years and years later, having finally served off his debt, a broken shell of a man from the one that left, the one who was optimistic that he would be able to turn his family’s luck around. What should people call most city dwellers caught up in the cycle of “work -> pay rent -> die”; all because they were not lucky enough to be born into the 1% of the families of the world that holds 90% of its wealth? They live their life paycheck to paycheck, not because they spend frivolously, but without having made a frivolous expense all their lives, just surviving in the demands made on the urban poor living in a city that mocks at them with how far they are lagging behind the rest of them. Modern day slavery may not take place in broad daylight, where auctions are held at the market to sell off little girls and boys into the world of prostitution, whereby they are treated to the ugliest side of human nature, where no one hears their cries for help. Modern day slavery is more insidious and vicious an animal in the way it manipulates, eludes and evades the established systems in place. Majority of us are shielded from this ugly side life here on Earth. Perhaps, the most blatant hypocrisy being that this form of exploitation is even “accepted” when it comes to the capitalist theory of development, where capitalist exploitation of the working class of nations lying on the semi-periphery and periphery are seen as the unnecessary evils of development. Modern day slavery thrives in every corner of the globe. As consumers, most of us are guilty of contributing to this cycle. Buying that t-shirt manufactured in a barely standing with multiple hazards in existence factory in Bangladesh which might burn down any minute. The love for handwoven carpets that has you buying one at an exorbitant price for your father who loves the intricate designs, only mere pittance of which is paid to the child whose nimble fingers are now no more. Perhaps the gold necklace that you just bought for your wife that contains gold mined by a child whose life has been extinguished by the lack of oxygen in the pit in which he worked more than 12 hours a day; until modern day slavery took away his life, the slavery which some cannot bring themselves to believe exists. Such is modern day slavery. Such is the insidious nature of human exploitation at work. Well said. It’s sad to hear that how badly they suffer to get daily bread. The same situation faces to the farmers in India and elsewhere.